The first Sultan-ul-Faqr Fatimah-tuz-Zahra was the beloved daughter of Holy Prophet Mohammad. She holds the status of first Sultan-ul-Faqr because her sacred soul manifested directly from Mohammadan light. Despite being a woman she traveled the most difficult stages of Faqr with great courage and firmness. Thus, her devotion and extreme Divine love elevated her to ultimate level of Oneness with Allah. As a result, the Holy Prophet made her first custodian of heritage of Faqr. That is why, true seekers gain Faqr i.e. Divine union, vision and presence in Mohammadan Assembly through her mediation. Also, she attained the status of supreme lady of all Muslim women. It is promise of Holy Prophet that Allah always grants the prayer asked through her mediation. Such is the status of belovedness of Fatimah bint Mohammad in the court of Allah. Prophet Mohammad said اَلۡفَقۡرُ فَخۡرِیۡ وَالۡفَقۡرُ مِنِّی meaning “Faqr is my pride and Faqr is from me”. The person who acquires Faqr from him unites with the Mohammadan light. Thus, becomes one with the holy essence of Prophet Mohammad. When Fatimah-tuz-Zahra acquired Faqr from the Holy Prophet, he said about her “Fatima is from me”. Ayesha bint Abu Bakr said, “I have not seen anyone resembling Holy Prophet more than Fatimah in habits and attributes”. She loved and obeyed the Holy Prophet to such an extent that she became his perfect image. The Prophet also loved Fatimah more than anyone else. Whenever she came to meet him, he would stand up to greet her and let her sit at his place. Whenever the Holy Prophet went out of Madina, first he used to meet Fatimah and then set on journey. Similarly, when he returned he wanted to see her first and then went to his own house. Certainly, this shows her highest status near Allah and His Prophet. Later, he said to her, “O Fatimah! If anyone belonging to your spiritual chain will recite Darood-e-Ahmadi with your permission, he (or she) will have the privilege of seeing me”. Afterwards, Fatimah bint Mohammad passed on the Trust of Faqr to her son Hasan following the order of Holy Prophet. Attaining to the Divine Oneness and union with Allah is possible through two ways. One is of Prophethood. Only the Prophets can find Divine Oneness and union through this way directly without any mediation. Hence, it ended on the last Prophet Mohammad. The other way is of sainthood. Followers of this way find the Divine Oneness and union through mediation and source. This group comprises of al-Qutb, Abdal, Autad and Saints. The source and mediation to travel this way is Ali ibn Abi Talib. This way particularly belongs to him. Prophet Mohammad heads him in this way. Fatimah bint Mohammad and his sons Hasan and Husayn unite in singularity with Ali in this status. Above statements prove that these four esteemed personalities hold similar and equal status in Faqr. Since they all have spiritual union with Allah and His beloved Prophet, hence they unite in Oneness. Fatimah Razi Allah Anha, the youngest daughter of Prophet Mohammad Sall Allahu Alayhi Wa’alihi Wassallam and Khadija-tul-Kubra Razi Allah Anha, was born 5 years before the annunciation of Mohammad’s apostleship. It was the time when Holy Prophet used to spend most of his time in solitude in cave of Hira. Over there, he meditated upon his Creator. Fatimah bint Mohammad was naturally very intelligent. She also liked solitude and never indulged in worldly affairs. Since childhood she had no attraction for playing with other children, fancy clothes or other pleasures of material world. She was engrossed in the Divine love from very small age. Fatimah used to ask her holy parents, “Can we see our Allah who has created us and all the worlds”. The Holy Prophet, keeping in view her love and curiosity about Allah, used to tell her about Him. Thus, she started having spiritual education and gnosis of Allah directly from the fountainhead of knowledge and righteousness, Prophet Mohammad. Allah had blessed her with extreme intelligence. Hence, she remembered and understood completely whatever she heard from her holy father. In 2nd Hijri Fatimah bint Mohammad was married to Ali ibn Abi Talib. She was a mirror image of the Holy Prophet. Her piety, endurance and contentment are matchless. Ali ibn Abi Talib was not sound financially but Fatimah never complained or demanded anything from him. She was daughter of the Prophet who is master of both worlds. Moreover, she held the status of queen of all Muslim women. Despite that she did all the household chores herself. She got blisters on her hands while grinding millstone. Her clothes got dirty while cleaning the house. However, she happily resigned to the will of Allah. Even in the worst situations of life, she remained pleased with Allah. Hence, Allah was also completely pleased with her. Explanation: Fatimah held such great status and grandeur that angles and jinn obeyed her. However, she was so humble that she had submitted her will to her husband’s will. She was the daughter of Prophet Mohammad and Khadija who were the embodiment of endurance and submissiveness. Hence, she also inherited these attributes from them. 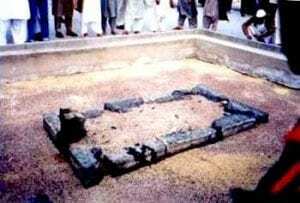 She ground the millstone and recited the Holy Quran at the same time. Angel Gabriel picked her tears from earth and spread them like pearls of dew drops in the heaven. Although Fatimah was completely engrossed in love of Allah and Holy Prophet yet she never neglected her role as mother. She fulfilled all her duties perfectly and in the best possible way. It was due to her upbringing that Hasan and Husayn reached the highest status of Faqr. She had induced in them the Divine love and indifference to the worldly pleasures since childhood. In short, she fulfilled all here responsibilities regarding religion as well as worldly affairs perfectly keeping balance between them. Certainly, it is not possible for any other man or woman to do so. Usually she had no money or other material objects that she could give as charity. Yet she was so generous that she never returned any beggar empty handed. Once she sold her shawl to help a newly convert Muslim. Fatimah bint Mohammad is the best role model for Muslim women. Following her footsteps all Muslim women can travel on the path of Faqr. Hence, reach Allah while keeping their worldly life in balance too. Her title is Batool which means ‘The chaste lady who has broken all her worldly connections just for Allah’. Death of Holy Prophet aggrieved Fatimah so much that she prayed, “Allah! Let soul of Fatimah join soul of Mohammad. Let me have the privilege of seeing him so that my heart finds peace. O Allah! Please forgive me on the doomsday through his intercession. Do not let me among the deprived ones”. All books of Hadiths and biographies of Holy Prophet state that after his death no one ever saw Fatimah smiling. Only after six months of Holy Prophet’s death, Fatimah-tuz-Zahra left this material world at the age of 29 years. Thus, she met her father in paradise on 3rd Ramadan, 11th Hijri. Before death she called Asma bint-e-Amees and said, “For my last ablution do not take help from anyone except my husband. Take complete care of my veil during funeral and burial and do not let much crowd gather around”. It was night when she died and was buried on the same night. 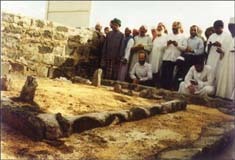 Her tomb is in Jannat-ul-Baqi.